Note to those with food allergies / intolerances: this book is completely gluten-free (obviously) and soy-free, and mostly dairy-free, but does use quite a few eggs and a lot of the recipes use nuts. What are Giveaway Wednesdays? (Almost) every Wednesday I will host a giveaway. It may be big, it may be small. It may be hosted on Facebook, Twitter, Alisa Cooks, or Go Dairy Free. You never know where I’ll pop up with Wednesday’s giveaway! But this week, it’s here on Alisa Cooks. How to Get a Second Entry? Tweet, Facebook, or otherwise share this giveaway with others, and leave a second comment letting me know that you did! Deadline? I will plan to pick the winner on Monday, May 23rd! Good luck! I’ll be back soon to report on the conference. Have fun at BlogHer Food! I wish I were going so that I could meet you! Sigh…next year? What an awesome cookbook! I have a lot of friends with Celiac’s so this would be perfect for whipping up treats that everyone could enjoy! I want this book because I was too dumb to buy it when I was on Amazon yesterday. I am also gluten and dairy free and just received 5 lbs of coconut flour and some almond flour. Now what am I supposed to do with all that stuff and why didn’t I buy this book? Only the Shadow knows. Raspberry Lemon Cake all dolled up for a birthday. Yum. Since becoming GF CF I have struggle not only with such big changes for myself but trying to incorporate some changes in my families diet. They are truly stuck in what they WANT. I have been eyeing this cookbook or a while but havent been able to afford to purchase it yet. This would be a great way that I can find ideas that I could “sneak” on the kids with good healthy alternatives to what they are used to. I love to bake and miss so much making fun, exciting birthday cakes that I too can enjoy. Gluten free baking is difficult at times. Thanks for your consideration and for doing a wonderful job helping those of us that struggle a bit with recipes. I would love this to help in fixing desserts for my granddaughter when she comes to visit. I’d love to win this because I’m GF and haven’t tried baking with nut flour and would love to. Thanks! I love Elana! She has so many “go to” recipes that fit my lifestyle and taste great! I have celiac disease and I recently moved out, so now I am learning how to cook. Every once in awhile I like to enjoy something sweet or different. I am extremely limited in what I can eat due to other health issues as well. It would be great to have a variety of sweet recipes that I can make and share with friends for celebrations! I’d love to win this for my mother. I recently persuaded her to try some of Elana’s blog recipes that use almond flour and she’s become a big fan. Her 75th birthday is coming up at the end of July. This would make a GREAT gift! 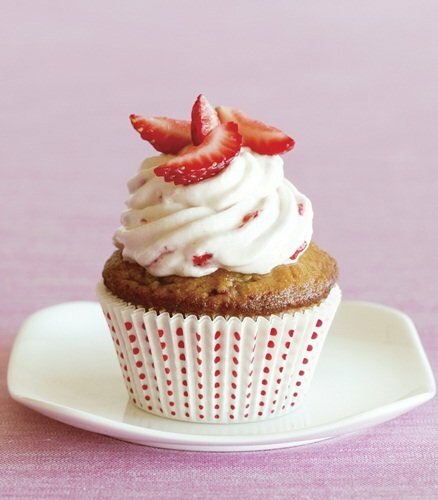 A GF cupcake cookbook sounds terrific, and the cupcakes look quite yummy. I love the cupcake shows on Food TV, and would absolutely love to make cupcakes for me and my family that we could all enjoy. Both my sister and I were diagnosed with Celiac in 2005, and it’s been a huge learning curve to adjust to living on a gf diet. One of the biggest difficulties is baking, it has been a challenge to find suitable alternatives to baking flour. 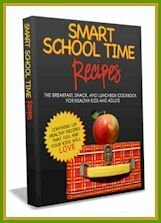 This cookbook would be ideal, and my daughters and I can bake cupcakes together! I’m getting hungry just looking at the pictures!! I love to bake and my sister & I are both GF so this book would be a wonderful addition to my shelf full of cookbooks. 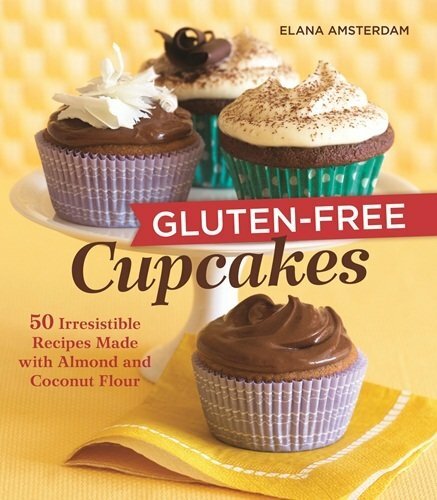 My daughter has a new friend that is allergic to gluten and I would love to have this book so I can feel confident in baking things for when she comes over! Now that I can have almond flour, this book will be perfect! But I’ll likely buy it, if I don’t win it. We just found out that our daughter tested positive for Celiac Disease. I would love to win this and start making her some yummy treats. It’s also her birthday in a few weeks, so I need some cake-substitution inspiration. Thanks for the great giveaway! Would love to add this to my Elana library…she’s awesome! i have elana’s first book, but it got ruined by water damage 🙁 i’d love to update my collection. I will use this book to try and find the perfect GF, DF cupcake that will taste as good or better than “regular” cupcakes. I’ve been looking for a good kid-cake recipe…maybe I’ll get lucky! thanks! My cousin got this book, and she made me a couple of the cupcakes for my birthday! I was so jealous I almost stole hers! So – it would be really nice to have my own!!! What a great book this would be to add to my two DF/GF cookbooks! I could make GF cupcakes for my co-workers. I would love to win this to bake with my son and my niece! I shared with my friends! I would love to win this book for my 3 year old that can’t eat wheat!!!! There’s some commercial on tv that I just spotted the other day that had beautiful flying cupcakes. I almost cried. I’m tired of feeling pathetic. I’d like to have something I can share with my son. That’s why I would like to win a copy of this cook book. As a newcomer to the scene of using different flours and nuts, etc… in baking and raw foods, I would so LOVE to win this cookbook! Would love to win this book!! Elana’s recipes are delish and love all the gluten free goodness. I JUST stumbled upon your blog and am so thankful I did! Over the past several months I have made some huge life changes in the ways of food and diet. After the process of losing an extreme amount of weight and successfully gaining it back ( to a healthy weight !) I have found that my digestive system is WAY out of wack. Gluten and dairy products are no longer staples in my diet and I LOVE playing around with new gluten free and vegan recipes. I would love to win this cookbook. I love Elana’s recipes…they are fast and easy with a few ingredients. She knows how to keep things simple..but good. I am struggling with staying gluten free and I believe this book can really help me. I was diagnosed with celiac disease last November after struggling to find the cause for my health issues for years, and just this week found that my 12 year old daughter has celiac as well. My daughter and I love to bake together, and we are determined to make the most of this lifestyle change by challenging ourselves to try new gluten free recipes that everyone finds enjoyable. My daughter and I would enjoy using this cookbook as a way to welcome our new gluten free lifestyle and still spend time in the kitchen together! I would love this book. I have tried five recipes so far and none have put a smile on my son’s face… Poor little guy just wants a birthday like everyone else. I’m recommending a great book to bake gluten free bread “the gluten-free gourmet Bakes Bread” author Bette Hagman, on amazon. Fantastic! I would to have this book! You have given me so much hope and encouragement while I go through eating changes. cupcakes are my new favorite thing — and i love elana’s other book so i can only imagine how great these recipes are! thanks for offering the giveaway! I am new to gluten free baking. I’d love to have a copy of this book. I have several food allergies and it’s difficult to find good recipes that work well. These cupcakes look splendid! I’m not sure if this ended or not. I would love to win a copy of the book as the recipes I’ve seen out of it so far are amazing looking. Our family has eaten gluten-free for about 6 months and we’re feeling great! I would love to have this cookbook as a reference for a few recipes to really wow people when we bring the cupcakes to social events. I don’t care much for baking so we mainly eat veggies and raw–this book would be great for inspiration for that something yummy. I want to win because I like cupcakes. 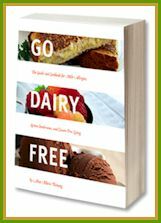 I have to start a dairy-free diet and came upon your website… hope it will help. Also, my daughter has to have gluten-free meals and this cookbook would be very very helpful.